The figure is an electron micrograph showing abnormally shaped and structured mitochondria in the liver of a mutant mouse that models methylmalonic acidemia. Credit: Patricia M. Zerfas, NIH Office of Research Services. Researchers have discovered that a hormone, fibroblast growth factor 21 (FGF21), is extremely elevated in mice with liver disease that mimics the same condition in patients with methylmalonic acidemia (MMA), a serious genomic disorder. Based on this finding, medical teams treating patients with MMA will be able to measure FGF21 levels to predict how severely patients' livers are affected and when to refer patients for liver transplants. 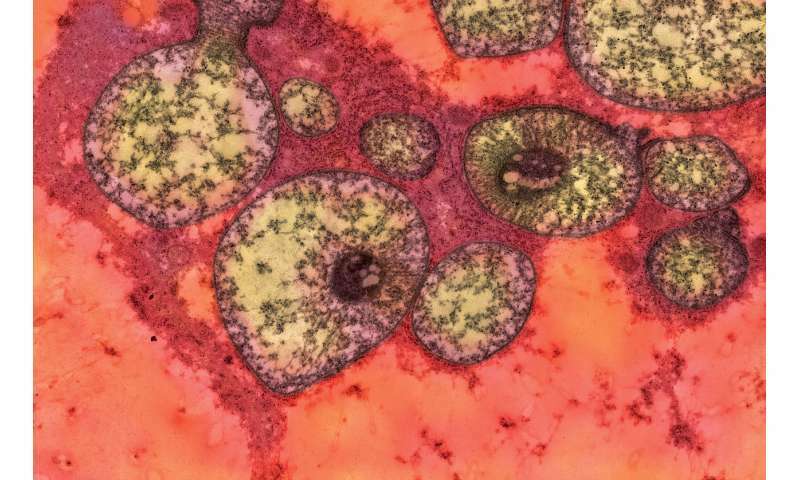 The findings also might shed light on more common disorders such as fatty liver disease, obesity and diabetes by uncovering similarities in how MMA and these disorders affect energy metabolism and, more specifically, the function of mitochondria, the cells' energy powerhouses. The study, conducted by researchers at the National Human Genome Research Institute (NHGRI), part of the National Institutes of Health, was published December 6 in JCI Insight. "Findings from mouse studies usually take years to translate into health care treatment, but not in this case," said Charles P. Venditti, M.D., Ph.D., senior author and senior investigator in the NHGRI Medical Genomics and Metabolic Genetics Branch. "We can use this information today to ensure that patients with MMA are treated before they develop severe complications." MMA is a genomic disease that impairs a person's ability to break down food proteins and certain fatty acids. The condition affects roughly 1 in 50,000 children born in the United States and can be detected through newborn screening. Children with MMA suffer from frequent life-threatening metabolic crises when they encounter a minor viral illness or other stressors like trauma, dietary imbalance or surgery. They must adhere to a special low-protein diet and take various supplements their entire lives. "We found that having MMA, whether in a mouse or person, causes stress pathways to be chronically activated and can impair their ability to respond to acute stress," said Irini Manoli, M.D., Ph.D., lead author and associate investigator in NHGRI's Medical Genomics and Metabolic Genetics Branch. "Our new markers can accurately predict how effective a therapy, whether cellular or genomic, might be for the patients." The NHGRI team will use FGF21 measurements along with other tests presented in the study in the design of upcoming gene-based clinical trials that the lab has worked on for many years. The NHGRI team will next assess the role of FGF21 pathways in other symptoms seen in MMA. Since 2003, Dr. Venditti and his team have conducted research on patients with MMA and are following 200 patients with MMA, the world's largest cohort. Their goals are to understand what defines the vulnerability to stress in MMA to better diagnose life-threatening metabolic crises that occur in patients, test new genomic therapies and find treatments that work for every patient.